BEIRUT -- "The Houthis are committing suicide," wrote Ali Muhsin. "Already their enemies are demonstrating in Taiz (intellectual capital of Yemen) and in Hodeida. They are a minority and they have many enemies inside the government and throughout the country." An intellectual, Muhsin had just written an article for the Egyptian newspaper al-Ahram, and was upset. He's a former Yemeni delegate to the Arab League, former Ambassador to India, and most importantly, a member of Yemen's Shiite aristocracy. His ancestor, in the 17th century, was Imam, or King, of Yemen. He is himself a de-facto member of the Houthi group, leaders of which claimed to have seized control of Yemen on Friday. Muhsin fears a civil war. Two sources in Aden late last week said the city is safer now than Sanaa. A year ago, when I was there, it was the reverse. The Houthis are on the warpath. "They want the head of Zindani," wrote Muhsin. Abdul Majid Zindani, called "America's man" in the 1980s because he led the recruitment drive to send young men to fight in Afghanistan, is a Wahhabi, trained in Saudi Arabia, said to be the most influential Islamic extremist in Yemen. In 2004, the U.S. Treasury designated him a "Specially Designated Global Terrorist." Muhsin founded, with Saudi money, Iman (Faith) University, where he became the mentor of Anwar al-Awalki who, in turn, became the mentor of Nigerian attempted underwear bomber Farouk Abdulmuttalab. A former Yemeni prime minister, and Zindani's cousin, said that he, not Abdullah Azzam, was Osama bin Laden's mentor. Tariq al-Fadhli, who was with bin Laden in Afghanistan and became founder of al Qaeda in Yemen -- not AQAP, which is a newer (2009) incarnation -- has fled his house arrest in Aden and gone into hiding in Abyan, also wary of the Houthis. The Houthis have been fighting AQAP (al Qaeda in the Arabian Peninsula). In spite of backing from Shiite powerhouse Iran they would seem, by definition, to be America's allies. There have been reports that the U.S., through intermediaries, has made contact with them. It's not far-fetched. Yes, they are backed by Iran, but the U.S. was on good terms with their fathers. Their ancestors, Zaidi Shiites, like they are, ruled Yemen for over 1,000 years, until 1962. "Shiite and Sunni lived together and married one another for 1,200 years," said Khaleed Alawa, former Yemeni Ambassador to France and Saudi Arabia, now living in exile in Egypt. "That changed with the U.S. invasion in 2003 of Iraq and now we have a sectarian war throughout the Middle East." In 1962, Egypt's Gamel Nasser, a Pan-Arab socialist, leader of the post World War II, post-colonial Non-alignment movement, invaded Yemen and with Yemeni republican army officers, overthrew the 1,000 year old Imamate (Shiite Kingdom). There was civil war and Yemen became Nasser's Vietnam. The U.S., Saudi Arabia, and the U.K. opposed Nasser and the young officers. 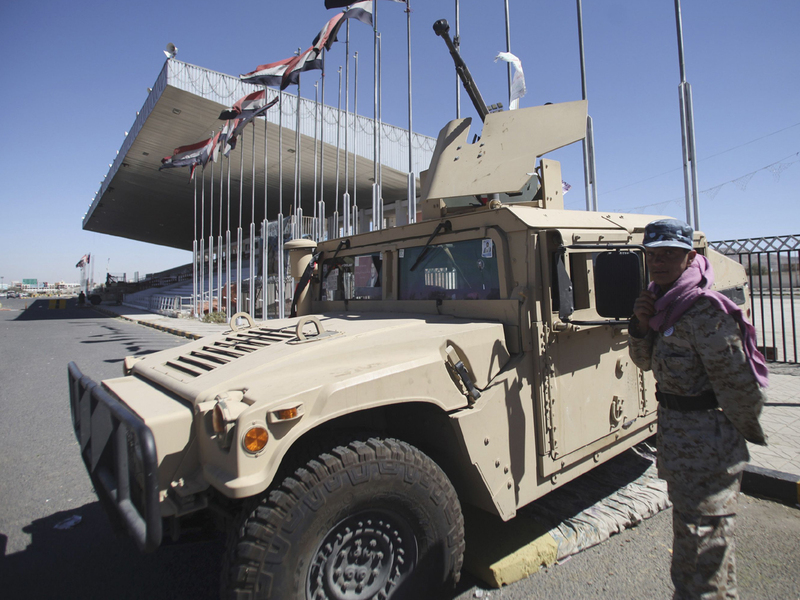 The U.S. side lost, and for the next eight years it refused to recognize the new non-royalist Yemeni government. The Houthis have been pining to return to power since 1962. How can they, a Shiite minority in a Sunni-dominated country, take over with so little fighting, and where do they get their weapons? From Iran, and from Ali Abdullah Saleh, who ruled for 33 years until he was forced to resign in 2012. In 2013, the Yemeni Navy, maybe with help from the U.S. Navy which patrols off the Yemeni coast, stopped the "Jihane," which, according to newspaper articles, was carrying Iranian weapons bound for the Houthis. But tanks and APCs would have to come from inside the country. That hardware probably came from Saleh, according to retired Yemeni government officials, freer to speak now, and newspaper articles. Several years ago, Saleh reportedly ordered his army officers to vacate their barracks with their soldiers -- but to leave their weapons and heavy armor behind. AQAP then went into the vacant bases and armed itself, according to a host of Yemeni newspaper articles. From March 2013, after the fall of Saleh, until January 2014, delegates from around the country met in the Movenpick Hotel, in a "National Dialogue," to write a new constitution and come up with a plan for the future. The U.N. representative published a list of those who were trying to disrupt the conference, principal among them; Saleh. In January 2014, they concluded their work. There would be a new constitution, and Yemen was to be divided into six federations. The Houthis are opposed to elements of the new constitution, and, like separatists from the South, to a federation. The South, a Marxist state from 1967 - 1990, which has more oil and more water than the rest of Yemen, wants to recreate an independent state. One leader said they would look to China for support. China, which has had ties to Yemen for over 1,000 years, buys most of what little oil Yemen exports. The Houthis will now change the constitution. Sources say now is not a safe time for anyone to travel to Yemen. It is better to wait to see what the Houthis, and Saleh, do next.